I mean thigh high Uggs... with a heel? Rihanna has left everyone scratching their heads after she rocked up in this latest ensemble. Never one to play by the fashion rules, we wonder if this one is just a step too far. Arriving to day two of Coachella in a sheer piece of fabric that just seems to be knotted around her waist and draped around her body strangely, but then that alone wasn't bizarre enough, because she then themed this caramel coloured piece of fabric with a baggy thigh high Ugg-esque heeled boot in the same colour. 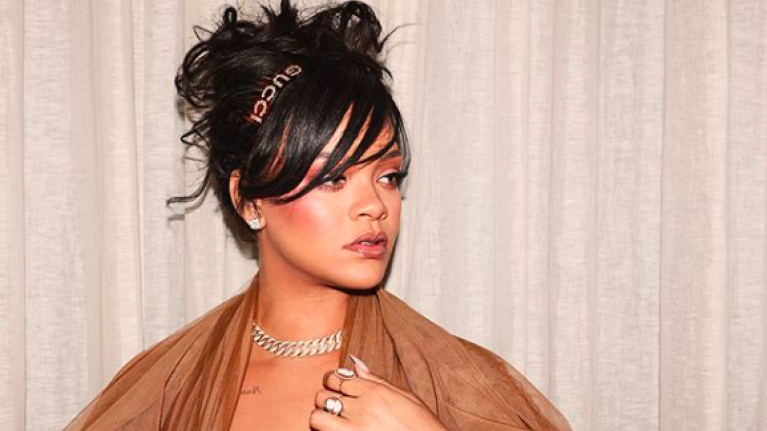 Rihanna then accessorised the entire look with jewels and an updo, giving it that serious OTT look (she usually rocks and pull off), however, this time we are not convinced. And it looks like Twitter feel the same, many people took to the platform to share their thoughts and it has caused a lot of debate. "This picture just screams C-O-N-F-I-D-E-N-C-E"
"Sack the stylist that pulled this... OMG NO." "Wtf is this? No Ri no..."
Rihanna seemed to have a ball at Coachella anyways, taking to her Insta to explain how she still couldn't get over Beyoncé's incredible performance which saw Destiny's Child reunite on stage as well as surprise performances from Solage and Jay Z. Incredible. You can read all about it here.